Mauricio Funes, a member of a political party that waged guerrilla war against the government 17 years ago, has claimed the presidency of El Salvador. “This is the happiest night of my life,” Funes told a jubilant crowd at his election headquarters Sunday night. “It’s also the night of greatest hope for El Salvador.” The FMLN party’s Funes had 51.12 percent of the vote, while the ARENA party’s Rodrigo Avila had 48.87 percent with 84 percent of the national ballots counted, the electoral commission said on its Web site. 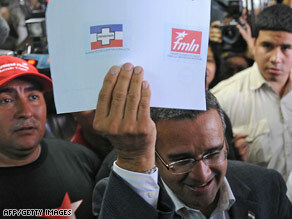 The electoral council had not declared a winner when Funes made his announcement. Although polls had indicated the race had tightened considerably in the past few weeks, most analysts said before the election that Funes was slightly favored to win. A Funes victory would end a 20-year hold on the presidency by the right-leaning ARENA. “It’s a sign that there’s democracy in that country, which is something the United States tried to foster,” said Bernard Aronson, who as President George H.W. Bush’s assistant secretary of state for inter-American affairs from 1989-93 was heavily involved in ending El Salvador’s 12-year civil war. The FMLN, which is the Spanish acronym for the Farabundo Marti National Liberation Front, was formed in late 1980 as an umbrella group for five leftist guerilla organizations fighting a U.S.-backed military dictatorship. The guerrillas and the government signed a peace pact in 1992 and the FMLN became a legitimate political party.